Today we have 5 Questions with one of the hardest workers in the sport, on and off the track. He wasn't a star in college, but has shown that through hard work and the right opportunity that comes with performing, things can certainly change for the positive. He's a multi-time National Champion and will look to make his first Olympic team this June in Eugene. 1. 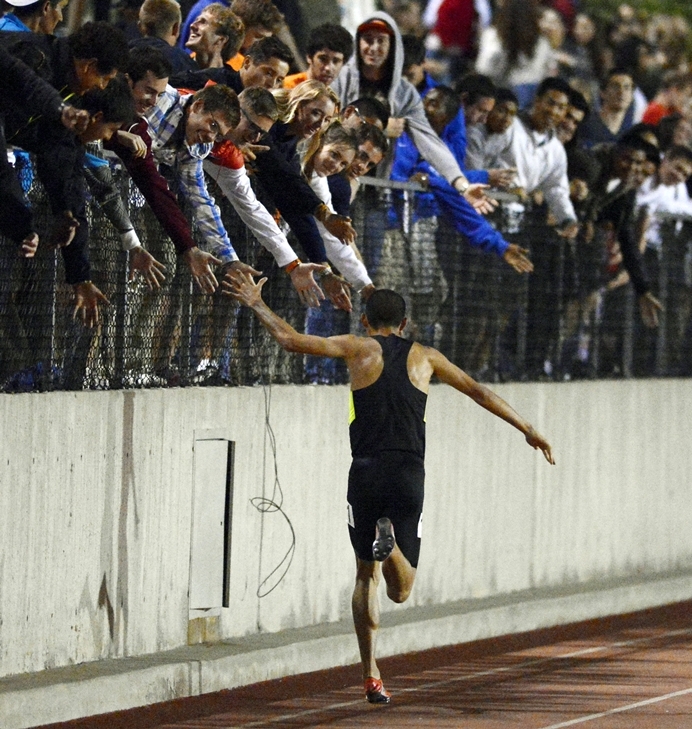 Writing About Running: First off, congrats on hitting the Olympic A Standard at Oxy (with a 3:35.41). Did your race plan go as expected? David Torrence: Thanks! It was a big weight off my shoulders. The race definitely did NOT go as expected. First of all, I think most everyone going into the meet was assuming the heats would go "Fastest" to "Slowest". When we got to the meet, and I saw that I was in the 3rd "equal" (note the parentheses) section with only one other fast guy, I was a bit flustered. But at the end of the day, I knew that I was fit enough to run 3:35 low in any type of race, and just went ahead. The pace was supposed to be 57's through 1000 meters, but they went out in 54 and there was some serious separation with the rest of the pack. I ended up having to take the lead a little after 800 meters and just worked my way up to try and catch Jamal Aarrass. Although I didn't quite get Aarrass, I was still kicking hard for home, and having him ahead helped my focus towards the line. So although I know I could have run a lot faster in a different race, at least I got the goal of getting that A standard at the end. On a side note, since I grew up in LA, I put together a little event invite for the meet and I had an amazing cheering section for me at the top of the homestretch. It was pretty awesome getting the standard in front of my whole family and a ton of friends. 2. Writing About Running: You now have Olympic A Standards in the 800, 1500 and 5000. You and Galen Rupp (1500, 5000, 10,000) are the only American distance runners that have hit three A's. I'd assume you're pretty proud of this range. How has your training set you up for this? David Torrence: It's good to have options, I can tell you that much. Yeah, I'm pretty proud of the accomplishment, but it's a bit of an empty one, ya know? There's no "Distance Decathlon", we're not in the business of being good at several events. I have to be great at one if I'm going to make this team. But to answer your question, my training is just pretty eclectic. We do a variety of speeds and workouts, and never just focus on one area too much. I did take a more focused approach to the 5000, and did some more specific stuff, but I never strayed too far from what I've done that made me fit and be fast in the past. 3. Writing About Running: The trials set up well for an 800/1500 double, but your kick would lend well to a tactical 5000. Are you leaning any particular way right now? David Torrence: My coach and I are looking at my workouts and feeling out these mile/1500m races. We'll probably make a decision after NYC this weekend. I don't want to say I'm leaning one way or the other, since I'm trying to keep my cards close to my chest for as long as possible. A double will be pretty unlikely, but still not out of the question. I can say this much though, if the 1500m was FIRST and the 800/5000 were second...that would've made things a LOT easier. 4. Writing About Running: Just a few years ago, you were running unsponsored with a "your ad here" sign on your chest. Now you're a multiple time national champion. What can you offer to those that were in your shoes a few years back? David Torrence: It's pretty cliche, but you have to really believe in yourself. I mean really. You're going to run into a lot of people who think you are wasting your time, and that you should be working or doing something else with your life, with your degree, etc. You're going to run into agents, meet directors, coaches, who think that you're wasting their time. Being somebody that wasn't a star in the NCAA system means that you are a nobody in the professional track world. And although it's not easy having to prove more than you're worth every time you step on the track, it is exactly what you are going to have to do. With all those people that are going to doubt you and think that you're foolish and naive, you have to be able to block it out and really know deep down inside that it is what you want to do, and more importantly, that it is something you CAN do. So yeah, be prepared for that. And don't get hurt. Injuries always hinder performance more than undertraining. 5. Writing About Running: You raced the Bowerman Mile this at the Pre Classic this weekend. How exciting was it to run in that kind of race? David Torrence: It was crowded. Wayyyy too many guys on the starting line. Caused the rabbit to have to get out crazy fast, which ended up affecting the overall pacing of the race. Although with me having one of the slowest PR's in the field, I guess it could be argued I was the rift raft that shouldn't have been in the race in the first place. But my sponsor, Nike, really took a chance with me, and believed that I belonged in that race, which really meant a lot. And considering I was the top American coming out of it, I thought it went pretty well. However, there are still some things I'm unhappy about. For example, with a lap to go I was in perfect position, right on Asbel's heels... but then I got shoved inside by Lopez (Lomong) and almost fell off the track. That was frustrating, since I felt I really could have been more of a factor in the top half of the race. With that questionable contact, I lost my position, rhythm, and a bit of energy staying up on my feet... but I was still able to kick the last 300 meteres with Amine Laalou, and being that he's a 3:29 guy, I felt good about that. I guess at the end of the day, it's good to come away from a 2 second PR knowing that you could have gone a lot faster.